How to add Teaser to your page/post? To add teasers to your page/post simply click “Insert Teaser” shortcode button, that can be found integrated in default editor panel in visual mode like in the image. Teaser’s settings comes with simple text fields, where you can fill in title, button title, image and button URLs and also a template dropdown menu. “Choose a template:” allows you to set a template which you want to be shown at your teaser. 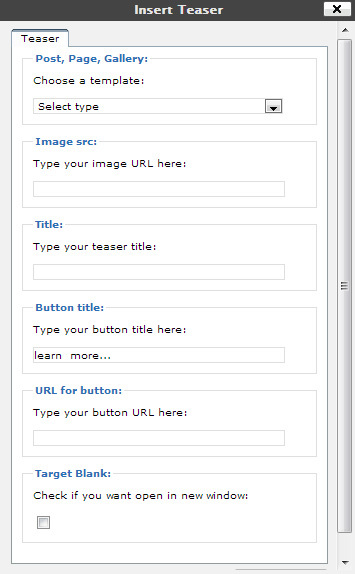 “Image src:” allows you to set the image URL that will be shown at your teaser further. “Button title:” field allows you to specify the name of the button: more… or learn more… for example. “URL for button:” field allows you to specify the path to necessary content after pressing the button. Once you have finished with your settings, press “Insert” button.